Trying to find the best probiotic supplement or probiotic drink like kombucha? Review amounts of cells found in popular brands, evidence for specific probiotic strains for uses such as IBS, diarrhea, and other digestive symptoms, allergies and colds, infections, weight loss and more. Plus, get information about proper storage, safety, side effects, drug interactions and more. 1. Have you heard of the probiotic, Keybiotics? Does it do what it claims, and is it worth the money they charge? 2. Has the probiotic VSL#3 been changed or discontinued? Is Visbiome a good alternative? 3. I am curious why some probiotics do not require refrigeration even though they contain some of the same bacteria in probiotics that require refrigeration? Which probiotics need to be refrigerated? 4. Is the probiotic "Milk Test," as described on many websites, really an effective way to test the quality of the bacteria in probiotic supplements at home? 5. Once I've taken probiotics for a few months, will the positive bacteria remain in my system, or do I have to keep taking them? 6. The probiotic I am taking looks pink. Does this mean it is spoiled or no longer "active"? 7. Can probiotics help lower cholesterol? 8. Do probiotics have to be enterically coated to be effective? 9. Do probiotics that come in different forms, like gum or lozenges, really work? 10. How do I choose the best probiotic supplement? There are so many different strains of bacteria! 11. I developed a rash soon after starting a probiotic. Is it possible to be allergic to probiotics? 12. I eat one to two cups of Greek yogurt every day. Do I still need to take a probiotic supplement? 13. Is it best to take probiotic supplements with or without food? It seems like everyone has a different recommendation. 14. What is Lactospore? I see it is an ingredient in some probiotic supplements. 15. Do probiotics really help prevent or treat vaginal yeast infections? 16. With probiotics, how many CFUs should I look for as the dose? Is more necessarily better? 17. When is the best time to take probiotics to prevent diarrhea from antibiotics - before, during, or after the course of antibiotic treatment? 18. Can probiotics reduce anxiety? 19. Do probiotics help with lactose intolerance? 20. What are prebiotics? Is it important to look for them when choosing a probiotic supplement? 21. Are enteric coated supplements better than non-enteric coated ones? 22. Can a probiotic help men with prostatitis? 23. I've seen the bacteria in Activia listed as Bifidobacterium animalis, Bifidobacterium lactis and Bifidus Regularis. Which is correct? 24. Which supplements have been shown to be helpful for autism? 25. Do vitamins, minerals and nutritional supplements lose effectiveness with exposure to high temperatures and is it safe to order supplements by mail in the summer? 27. Which supplements are helpful to have when traveling? Any tips on how to best store supplements on trips? 28. What is the difference between the "Best By" date and the "Date of Manufacture" on a supplement label? How do I know how long my supplement will last before it "goes bad"? 30. Do any supplements help for irritable bowel syndrome (IBS)? 31. Do any supplements help prevent or treat a cold? 32. Is it true that NAC can help clear nasal passages? 33. Which supplements are best for seasonal allergies? 35. Does turmeric/curcumin help for osteoarthritis in dogs and cats? Is it safe? 38. I read that sterol supplements to lower cholesterol like CholestOff can block the absorption of vitamins. Is that true? 39. My dog is getting older and his veterinarian recently recommended giving him a glucosamine supplement for his joints. Has ConsumerLab.com tested these, or other supplements for pets? 41. Which supplements can help with indigestion and/or heartburn? 42. Which supplements can help to lower blood pressure? 43. Are "medical foods" such as VSL 3, proven to work? Does the FDA approve them? 44. Can CoQ10 or ubiquinol be ruined by heat? I recently purchased several bottles of Qunol Plus from Costco.com and they arrived hot. The soft gels are not melted, but I am concerned. 45. How can I find supplements that are gluten-free on ConsumerLab.com? 46. I have low blood pressure. Are there any supplements I should avoid? 47. Which supplements can help treat constipation? 48. Do any supplements help for ulcerative colitis? 50. Is it true that yogurt and kefir can trigger migraines? 51. Are there any supplements I should avoid when taking an antibiotic? Are there any that may be helpful? 52. 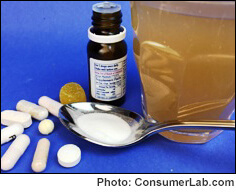 Are liquid vitamins better than pills? 53. Do any supplements reduce side of effects of chemotherapy? 54. Which supplements help with depression and anxiety? 55. Is it okay to crush a tablet and consume the powder or add the powder to food, rather than swallowing the tablet whole? 56. Is it true that iodine can cause acne or other skin problems? 57. Do any supplements help relieve stress? 58. Do any supplements help with gum disease or periodontitis? 59. Tablets I purchased are becoming "crumbly" after a few weeks and are easy to break. Is there a problem with this supplement? 60. Which "whole food" multivitamins are only from foods and don't include synthetic vitamins? What can you tell from the labels of these products: Complete Foods Nutrition-OctoMega MultiVitamin; Sunwarrior Raw Vitamins; Garden of LIfe-MyKind Organics; Nature's Brands-PhytoVitamins; Doctors' Research MultiVitamin? 61. Which supplements can help lower or control my blood sugar? 62. How much should I expect to pay for supplements? Are higher-priced supplements any better than low-priced brands?